The 1977 film, Audrey Rose, tells the story of an annoying little girl named Ivy (Susan Swift), who is the daughter of annoying Janice (Marsha Mason) and annoying Bill (John Beck). Everything seems to be perfectly normal until, one day, they notice that they’re being followed around by an annoying man named Elliott (Anthony Hopkins). Elliott explains that Ivy is the reincarnation of his daughter, Audrey Rose. Whenever Elliott says, “Audrey Rose,” Ivy going into a trance and starts screaming. Elliott explains this is because Audrey died in a fiery car crash and was apparently reincarnated too soon after her death. Therefore, anytime Elliott shows us, Ivy relives the crash and tries to burn herself. To me, it seems like there’s a simple solution to all of this. Elliott could just go away or, at the very least, stop saying, “Audrey Rose” every ten seconds. Anyway, at one point, Ivy starts screaming so Elliott rushes into the apartment and makes her stop. However, Elliott is accused of attempting to abduct Ivy, arrested, and put on trial. Audrey Rose was directed by a legitimately great director, Robert Wise. Unfortunately, Wise takes the material way too seriously. Just when you think the film is going to be an over the top possessed child flick, it suddenly turns into a turgid and serious debate about reincarnation. The movie is so busy trying to be realistic that it forgets to be fun. There’s also a lot of yelling in Audrey Rose. In between Ivy screaming and Elliott continually calling his dead daughter’s name and Bill arguing with Janice and random characters screaming whenever Ivy gets to close to a fire, it’s easy to get a headache while watching this film. Mason and Beck are pretty lousy in the roles of Janice and Bill. Hopkins brings an occasionally neurotic edge to the role of Elliott. You never quite trust him, even though the movie wants you to. The best performances in the film come from the performers in the minor roles, character actors like Norman Lloyd, Robert Walden, and John Hillerman. None of them are required to pretend like they’re taking their dialogue seriously and, as such, they’re a lot more fun to watch. All in all, Audrey Rose is a fairly silly movie. For some reason (probably the presence of Hopkins), it does seem to show up on TCM fairly regularly but I wouldn’t recommend watching. If you want to see a good Robert Wise horror movie, check out The Haunting. I recall watching this last summer on TCM’s “Underground” They had a double feature of Anthony Hopkins horror movies. 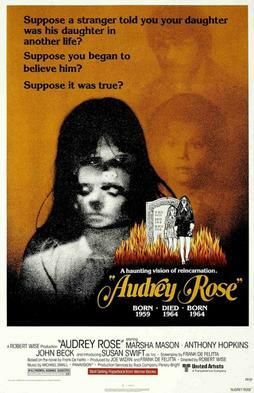 This one and the much better “Magic.” I must not have liked AUDREY ROSE because I don’t remember much about it.